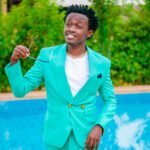 Gospel singer Bahati has come out to share that he has lost a lot of money at EMB Record while trying to manager artists. EMB has been on a spiral downfall of late and the singer has been working hard to try and do some damage control as artist after another started leaving. Losing money On Wednesday, the gospel singer relaunched the label and named Danny Gift as his new signee. In an interview with Kiss 100 after the event, the singer confessed that managing artists is hard and he has lost a lot of money in the process. Six million to be exact. “I lost 6 million when trying to manage my artiste and even execute a project. A song could cost me Kshs450-500,000 but fewer returns and it is okay. So in the midst of it all, I spent a lot,” he admitted to Kiss 100. Interestingly, Bahati had confessed that EMB is not a business but more of a ministry several weeks ago. Why is he changing tune. “EMB entertainment is a business which wants to raise people, actually it’s more of a ministry because it doesn’t make money from the artistes. So if money is not involved you cannot fall out with anyone. We are still building and it’s time for another artiste (to be signed),” he explained during an interview on Mambo Mseto where he addressed his apparent beef with Mr Seed. The post Bahati says he lost Ksh 6 million while trying to manage artists at EMB appeared first on Ghafla! Kenya.